Los Angeles based hip-hop/rock veterans HOLLYWOOD UNDEAD have announced the release date of their forthcoming studio album, Day of the Dead. 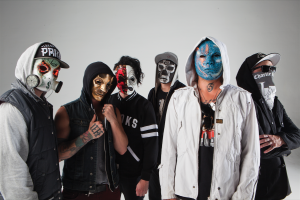 The album (the band’s first since 2013’s Notes from the Underground), will be released March 31st on Interscope Records and will feature the current single and title track, “Day of the Dead.” Leading up to the release, the band will be unveiling five new tracks from the album, beginning with “Usual Suspects” on February 17th. To celebrate the release of Day of the Dead, the band will be hitting the road for a special U.S. album release tour where fans will be treated to shows in small venues. Tickets go on sale February 11th and the band is offering a digital delivery of the new album (on March 31st) and the six tracks (prior to March 31st) to fans that purchase a ticket. 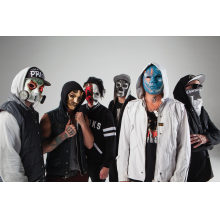 Tour dates are below, tickets on sale February 11th at www.hollywoodundead.com. on Facebook, Twitter, Instagram or their official site.